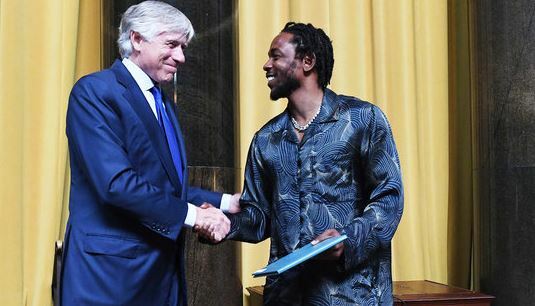 Kendrick Lamar, American rapper, on Wednesday received a Pulitzer Prize for his fourth studio album ‘DAMN’. The accolade awarded to the ‘Humble’ rapper makes him the first non-jazz or classical artiste to receive the honour. Lee C Bollinger, president of Columbia University, described the album as “a virtuosic song collection unified by its vernacular authenticity and rhythmic dynamism that offers affecting vignettes capturing the complexity of modern African-American life”. For ‘DAMN’, Lamar won four Grammy awards, including best rap album. “It’s an honour. Been writing my whole life, so to get this type of recognition is beautiful,” Lamar said on accepting the award. Lamar joins the likes of Aaron Copland, Gian Carlo Menotti and Wynton Marsalis as a music honoree.